Bifocal safety eyewear allows workers extra magnification to clearly read instrumentation and documents, work with small parts, or perform other close-at-hand tasks. 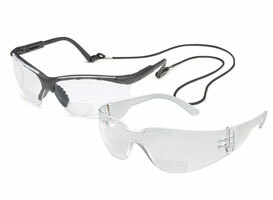 A clear 3.0 diopter lens option has been added to two bifocal eye protection styles – Scorpion MAG and StarLite MAG. Both are available in five diopter strengths: 1.0, 1.5, 2.0, 2.5 and 3.0.